Sudo is “a program for some Unix and Unix-like computer operating systems that allows users to run programs with the security privileges of another user (normally the superuser, a.k.a. root).” (Wikipedia reference). It works great for command line applications – especially for running them from a terminal prompt, or as part of a shell utility. 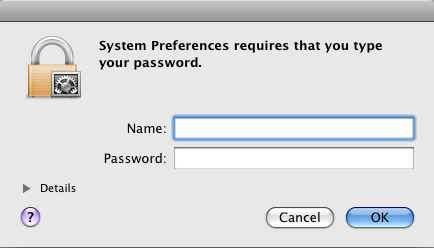 For Mac OS X Cocoa-based apps, there is analagous ability to sudo provided via the Authorization Services API. Use of the API allows you to prompt the user for their username and password requesting the ability to escalate privileges. The Authorization Services API is a bit complicated. All the more so if you’re not writing a Cocoa app in Objective C. For example, maybe you’re using a scripting language, or you’re writing your GUI in Java / Swing for cross-platform use. For that case, I’ve written a small utility that I’ve dubbed cocoasudo. Use cocoasudo in much the same way you’d use sudo. However, instead of users being prompted for their password in a Terminal window, they’ll get a dialog prompt via the Authorization Services API. Both the –icon and –prompt parameters are optional and may be omitted. Or, if you don’t have Xcode, or don’t want to compile from source, you can download the cocoasudo binary directly here. cocoasudo is Apache-licensed, so you can mostly use it as you see fit. Tell iPhone Devs – Pick Up The Phone! At 8:45 Monday night, I received a call from an unrecognized number with a 408 area code. As a general habit I do not answer unrecognized calls in the evening. The iPhone said the number originated from Palo Alto, but I didn’t think much of it. 30 seconds later I received another call from the same number. Still didn’t answer. At this point, my jaw dropped. This is exactly the kind of call I had been hoping for, but realistically I never expected to get. Standing out in the App Store is difficult, and this could be a big opportunity for the iGarageSale app. It was late in the evening and I was at home hanging out with my son. I quickly scrambled to get him a toy to occupy him for a couple minutes, and then I returned the call. The gentleman at Apple indicated that they were interested in featuring iGarageSale in iTunes and that they really like the app. However, they wanted me to change a bit of the description first. Purchasers of iGarageSale receive a free MP3 download of “Holding On” by the independent artist, Mr. J. Medeiros. This is the song featured as background music in the demo video for iGarageSale. Apple was fine with purchasers getting a free copy of the song as this is something that had been legally agreed to with the artist, but they wanted me to remove that fact from the description of the app in iTunes. They wanted people to buy the app for its own merits, not in the hopes of a free bundled MP3. I assume this is also to avoid potential confusion and complaints directly to Apple later, which is understandable. Since they didn’t require me to take away the freebie – just the promotion of it in the iTunes description, I said I’d make the change immediately. Naturally, I was pretty stoked to see this. Yesterday was the first full day the app was featured in the New and Noteworthy section of iTunes. So, what kind of difference does it make to be featured? 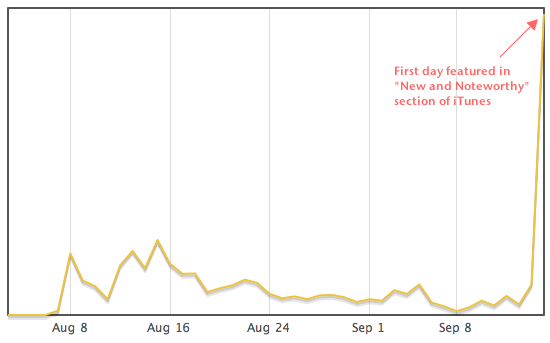 Other peaks on the graph cover things like the first weekend of the release, an ad campaign the following week, pricing promotions, and the introduction of a Lite app. However, all of those events pale in comparison to being featured in the App Store. So, in conclusion – if you’ve released an iPhone app and you get a call from a 408 number, I suggest you answer! The first option is quick to implement, and an OK option for initial testing. However, it is inherently insecure as it requires you to release your Facebook application’s secret key embedded in your code. On browsers such as Firefox, the scrollIntoView function silently returns without action if the element in question is already on the screen. However, in IE6, and perhaps other browsers, it causes the screen to scroll even if it is already in view. To workaround this, and only call the scrollIntoView function if the element in question is out of view, I wrote the following helper method — scrollIntoViewIfOutOfView. Even with today’s modern IDE’s and plethora of search tools (Spotlight, etc. ), I still find myself occasionally dropping to a bash shell to look for something in an unknown file. In the past, I was a bit frustrated that my combination of find | xargs grep would bomb out on any files or directories that included a space. Today it dawned on me that there’s a simple workaround for this… Prefix and postfix each file with a quote via sed. The following example recipe will find the text textIAmSearchingFor in any .java file in the current tree. I’ve finally taken the time to play around with Yahoo Pipes. I’ll probably do a few posts over the next couple of days on my findings, but I’ll get started with the basics on how to write a json web service in PHP that can be called from Pipes. The capability to call a web service from Pipes is a recently added addition by Yahoo that could prove to be very powerful. There’s a good post and recipe for getting started over at echoditto labs. Unfortunately, my web host had two things that made this recipe a non-starter. First, they don’t allow compiling C++ extensions for PHP, as is required by the JSON PECL package. Second, they have PHP’s annoying little magic_quotes_gpc setting turned on. Here’s a little recipe that may help you get started. You’ll need to first download the Services_JSON library — a proposed addition to PEAR that encodes and decodes JSON. The recipe below assumes that you use items as the input for the “Path to item list” prompt in Pipes. The recipe is simple and straightforward. It is the moral equivalent of Yahoo’s Java example — it simply appends ” (This text was added by the external Web Service)” to the title of each item in the feed. It provides one additional bit of functionality that may help you get started. It logs the decoded input value to pipes-log.txt. This will help give you an idea of what your input is. PS – Please comment if you’ve found an easier means to this end. I have written the following script and have found it to be a rather effective, minimally invasive, and low-tech way to track down troublesome SQL statements when tuning my apps for SQL Server. I’ll usually set it up as a SQL Server Agent job to run once per minute. It logs all currently running SQL statements to the SQLLog table, for analysis at a later date. (Note that the job must be run as the sa user, or another user with sysadmin privileges in order for the fn_get_sql function to work.) The thing I like about this technique is that it seems to get a good cross-section of both long-running statements, and statements that may be short in duration, but are run often. I’ll then do a count on statements to see where to focus my tuning efforts. Enjoy!